There is something inherently magical about horses that attracts many children. Toy manufacturers key in on this interest with an increasingly impressive range of horse toys to suit kids of all ages, from learning toys for infants to rocking horses for older kids. Babies have the incredible habit of putting just about everything in their mouths, so choosing infant-friendly horse toys is important for safety. These baby-appropriate toys provide learning opportunities and lots of fun. For some inexplicable reason, all infants seem to love tags. 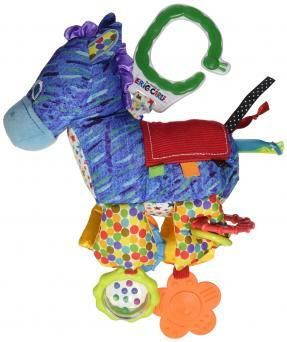 Toys like the Developmental Horse from The World of Eric Carle, the author of The Very Hungry Caterpillar and Brown Bear, Brown Bear, are perfect for little ones to explore different designs, patterns and textures. The tags can be safely pulled and teethed on, while the toy itself is easily attached to a crib rail, stroller or carrier. This toy retails for about $20. For a baby toy that's more traditional and classic in appearance, this Soft Chime Toy Horse by Mamas & Papas is a wonderfully soft and adorable choice at around $15. Rather than overwhelming the child with bold colors, the finer embroidery details provide a more comforting appeal. The dangling legs are easily grasped by little hands. Recommended for children over one year of age, the Mother and Foal from the VTech Go! Go! Smart Animals series are a great addition to your existing play set. When the little plastic horses pass over SmartPoint locations on the play sets, fun phrases, sound effects, animal sounds and nature sounds are played. Further interactive elements are also enabled, including sing-along songs. The retail price for this set is around $13. 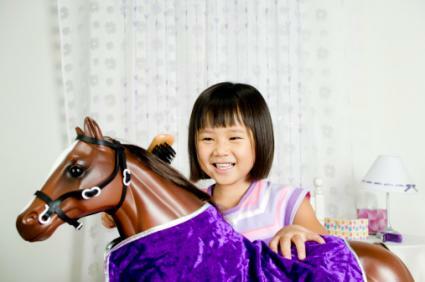 Kids love to hug their soft plush toys, but there is so much more to these toy horses than a basic stuffed animal. These toys are mostly appropriate for toddlers around three years of age and up. 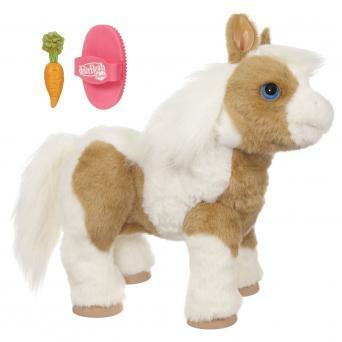 A part of the hugely popular FurReal Friends family, Baby Butterscotch is a wonderfully soft, magical show pony. Selling for around $100, she responds to your touch and your voice, moving her head and ears in reaction, making pony sounds just like a real horse. The pony will glady "eat" the carrot you feed her and move in the direction you pet her. There is still a definite appeal to the classic plush animal and this cute pair from the iconic FAO Schwarz is a beautiful example. The brown and white mare measures 13 inches in size and her adorable foal stays safe between her mother's legs. They are both covered in very soft fur with extra fluffy manes and tails. This pretty pair can be purchased online for around $25. The Beanie Babies series from Ty expands with licensed plushies from My Little Pony. Available individually for around $8 each or as part of a $40 set of six, these tiny renditions of the popular franchise are sure to be a hit, whether the child is a fan of Rainbow Dash, Pinkie Pie or Twilight Sparkle. Larger versions are also available for around $25. Children are limited only by their imaginations. Pretend play toys let them explore the possibilities of working the stable and showing a horse without ever leaving the house. Because of the small parts, these toys are generally not recommended for children under three. Made with the high standards of quality you've come to expect from Melissa & Doug, the Show-Horse Stable kit for about $25 includes a total of eight different horses, each with their own stall inside of a stable box that can be easily closed up for travel. Each stable door opens individually and latches closed. The illustrated guide to horse breeds lets kids learn more about each of the horses in the kit. The iconic Barbie has many hobbies that take her away from her dream home, and one of these is her equestrian interests. The Saddle 'N Ride Horse Barbie ride off to adventure in style atop the cute pink saddle with matching reins. The horse actually walks on its own with the simple press of a button. Pricing is around $40. The best horse toys don't necessarily have to be fancy or come with brand names. When it comes to pretend play, it's often the more the merrier. A great budget-minded option is this collection of two dozen vinyl toy horses by Fun Express for about $8. Available in a range of colors and designs, the horses can be used for play or as a goodie bag stuffer at a birthday party. 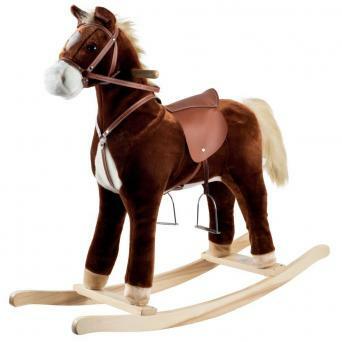 For the youngest riding enthusiast, Patches the Rocking Horse by Step2 is a safe and simple option for plenty of smiles. While lightweight for ease of transport, Patches is well constructed with a sturdy design to prevent tipping or over-rocking. The contoured seat and easy-grip handle bars ensure your little rider is comfortable and can hold on for a rocking good time. Ideal for toddlers starting around one year of age, Patches retails in the $40 range. For a more rambunctious romp, the Rockin' Rider Spring Horse provides young riders with a very bouncy experience. The horse, wrapped in soft plush, is mounted on a spring-loaded metal frame. Motion activates a galloping sound and the moving mouth can even sing and talk. The three-position stirrups accommodate kids of different heights. Best suited for children between two and four years old, this riding horse sells for around $160. Featuring a classic design and solid construction, the Happy Trails Plush Rocking Horse is built to be very sturdy for extended play sessions, with lots of padding for added comfort. Other key features on this toy recommended for children around three years of age include authentic-looking stirrups, a leather-like saddle, genuine-looking reins and a handcrafted wood core. Pricing is in the $80 range. Most children don't grow up with a stable full of ponies in their backyards. The incredible variety of horse toys empowers their imaginations as they corral their ponies into tiny stalls or ride make-believe horses with authentic neighing sound effects.